Updated: 2005-10-22. Something not right? Please update the information. 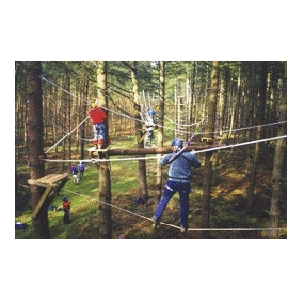 Hiking trails, formal campfire circle, obstacle course, pioneering supplies, sledding, high ropes course, rock climbing, mountain bike trail, mountain bikes available, volleyball, sports field. Woodland Trails has 19 campsites which are spread through a breathtaking landscaping. Why trudge through the snow when you can ski on the camp's groomed cross-country trails? There's no better way to beat the summer heat than taking a dip in the Olympic-sized pool. A quick jog on the obstacle course is a good way to warm up on a chilly morning.